What if Elvis never left the building? What if, in fact, he were still alive, an irascible, grey-haired old codger with a dodgy hip and a 'growth on his pecker' (his words, not mine), living in a run down rest home in Texas? And. and. what if that rest home had fallen prey to an evil undead Mummy, who was feeding on the souls of the elderly inhabitants? Think that sounds a little far-fetched? Possibly, but that doesn't stop it being the premise of Bubba Ho-Tep, which finally hit the big screen this month. Part cult horror movie, part old man buddy movie, all total genius, this is definitely one of the best films of 2004. Bruce (Evil Dead) Campbell plays Elvis - and yes, we do believe he's the King of rock'n'roll, not just some random crazy person. He swapped lives with an Elvis impersonator, you see, who then died, and then Elvis fell of the stage and busted his hip. you get the picture. With two central protagonists like this, you can forget about your usual horror film supernatural scepticism. If you're a black man who thinks you're JFK, believing in evil soul-sucking Mummys isn't such a difficult leap of the imagination. And, armed with a copy of Every Man and Woman's Book of the Soul (a kind of Woman's Weekly annual for wannabe occultists), it doesn't take him long to convince Elvis that death is stalking the polished halls of the rest homes, feeding on the 'small souls' of the crazy, lonely old folks. After all, the clues are all there: if the epic battle with a huge pus-oozing scarab weren't enough, there's always the naughty hieroglyphic graffiti in the men's loo. oh, and the monster himself, lurching unconvincingly down the corridor, rotting skeletal frame forced into. a pair of cowboy boots. Dragged straight from the vaults of the Hammer Horror archives, the Mummy clearly hasn't been dusted down since the '70s. 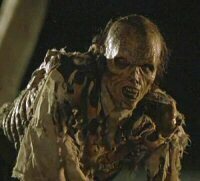 Shambling about the rest home like a reject from Shaun of the Dead, he's about as scary as, well, anything in Van Helsing really. (You had to know I'd take another dig.) Oh, and despite an elaborate build up at the beginning of the film to acquaint us with his back story, we're never told why the Mummy is wearing cowboy boots and a Stetson. But scaring the pants off the audience isn't really the point of this film, because the deliberately daft horror plot comes a poor second to the human story. Yes, the plot is ridiculous, but the characters of Elvis and Jack are utterly convincing. And because we believe in them 100 per cent, we somehow manage to accept the ludicrous concept of Elvis and JFK battling a Mummy. With an insecticide pump and a zippo. 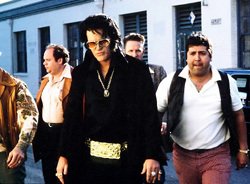 Bruce Campbell gives the performance of a lifetime as Elvis. This is no cheap, one-dimensional karaoke impersonation, this is the real deal: a brilliant depiction of the King in decline, exchanging his golden throne for a bedpan and his wiggle-hipped walk for a zimmerframe shuffle, and looking back on his life with a bitter sweet mix of nostalgia and regret. Campbell has Elvis's voice, expressions and mannerisms down to a T, and it's worth going to see the film just to watch him slip famous Presley phrases almost unnoticeably into the dialogue. 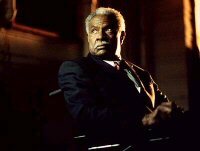 Ossie Davis, meanwhile, is equally impressive as Jack, investing the role with a dignity and gravitas that's worthy of Morgan Freeman. Together Elvis and Jack make an unforgettable pair, a Butch and Sundance for the Prozac generation: two old crocks in pyjamas and slippers who must take on an evil, soul-sucking Mummy and save their fellow senior citizens from a fate worse than death. And in so doing, they also save themselves from a slow, dismal slump into old age and decay, confronting their fears with dignity and courage and finally becoming heroes. In a white Vegas jumpsuit and a wheelchair, naturally. All in all, Bubba Ho-Tep isn't really a horror film, it's a tale of two old men whom life has given up on, but who themselves refuse to give up on life. Bursting with originality and hilariously funny (the scarab scene is pure comic genius), it's also immensely poignant: it will literally have you in tears with laughter one minute, and weeping with pathos the next. In a world that tends to write off its old people (especially when it comes to giving them starring Hollywood roles), it's refreshing to see a film that is entirely anchored by two ageing bufties with mobility problems. Ingenious, heart warming and an instant cult classic, I give you Bubba Ho-Tep. Thank you very much.